JERUSALEM — Israeli Prime Minister Benjamin Netanyahu’s latest accusations about Iran’s past nuclear activities received a warm welcome in Washington but a far cooler reception in Europe on Tuesday — deepening divisions among Western allies ahead of President Donald Trump’s decision on whether to withdraw from the international nuclear deal later this month. U.S. Secretary of State Mike Pompeo said the U.S. would discuss Israel’s newest purported evidence with the other global powers that negotiated the 2015 nuclear deal. But Britain said the information reinforced the need to keep the deal in place. Netanyahu has been an outspoken critic of the deal, which offered Iran relief from crippling international sanctions in exchange for curbs on its nuclear program. Netanyahu says the deal will not prevent Iran, Israel’s most bitter enemy, from reaching a nuclear weapons capability. After clashing with President Barack Obama when the deal was negotiated, Netanyahu has found a close ally in Trump, who has called the agreement “the worst deal ever.” Trump has signaled he will withdraw from the agreement by May 12 if it is not renegotiated and changed. 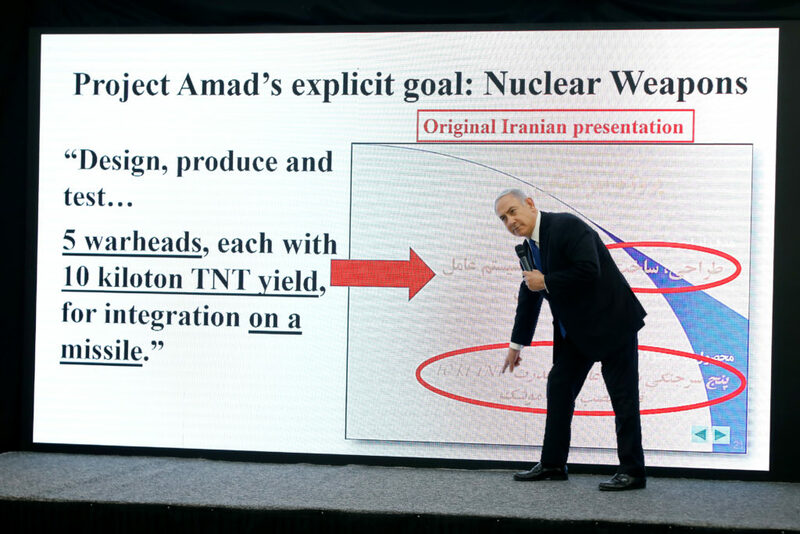 Netanyahu’s presentation late Monday, delivered in English on live TV and making heavy use of visual aids, appeared to be aimed at swaying global opinion ahead of Trump’s decision. He unveiled what he said was a “half ton” of Iranian nuclear documents he said were illicitly seized by Israeli intelligence. Netanyahu said the documents provided evidence that Iran attempted to develop a nuclear bomb in the previous decade, especially before 2003. Although he gave no explicit evidence that Iran has violated the 2015 deal, he said Iran had clearly lied in the past and could not be trusted. Iran has denied ever pursuing nuclear arms. Netanyahu said the trove of documents showed that Iran is “trying to bamboozle the entire world” and expressed hope that Trump would pull out of the deal. Pompeo, who was returning to the U.S. after his first official visit to the Middle East, said he had discussed the material with Netanyahu during a stop in Israel this week and would raise the matter with European allies. He said the documents showed Iran sought nuclear weapons and hid a vast archive of information from the world and the U.N. nuclear agency. “What this means is the deal was not constructed on a foundation of good faith or transparency. It was built on Iran’s lies,” he said. The initial European reaction, however, was cool. “The Iran nuclear deal is not based on trust about Iran’s intentions; rather it is based on tough verification,” he said. The U.N. nuclear watchdog, the Vienna-based International Atomic Energy Agency, has said Iran in the early 1990s “may have received design information for a nuclear explosive device from a clandestine nuclear supply network.” It says Iran also worked in the 2000s on explosive detonators that “have characteristics relevant to a nuclear explosive device,” as well as done other work, though all that appears to have stopped in 2009. Responding to Netanyahu’s speech, the IAEA issued a statement Tuesday reaffirming that “the agency had no credible indications of activities in Iran relevant to the development of a nuclear explosive device after 2009.” The IAEA has repeatedly certified that Iran is in compliance with the 2015 nuclear deal. Although Netanyahu gave no explicit evidence that Iran has violated the 2015 deal, he said Iran had clearly lied in the past and could not be trusted. In a “preliminary reaction,” EU foreign policy chief Federica Mogherini said Netanyahu had not provided evidence that Iran is violating the current deal and noted its continued compliance. Yoel Guzansky, senior fellow at the Institute for National Security Studies, an Israeli think tank, said Netanyahu’s message was unlikely to change minds in Washington or Europe. Although Iran has threatened to withdraw from the deal if the U.S. pulls out, Guzansky said Tehran would likely be more cautious, and much will depend on the reactions of major companies. Iran dismissed Netanyahu’s move as a “ridiculous” show but did not address the documents he produced. Israel and Iran are currently involved in a standoff in Syria, where Iranian troops are supporting President Bashar Assad’s forces. Israel has warned that it will not allow Iran to establish a permanent military presence in Syria, fearing it will use its positions to strike Israel. Israel has been suspected in a pair of airstrikes on Iranian targets in recent weeks, though it has not confirmed involvement, and Iran has threatened revenge. 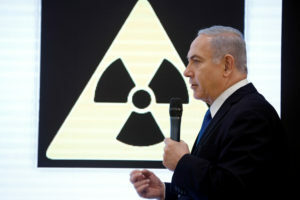 Israeli Cabinet Minister Yoav Galant said the seizure of the Iranian nuclear documents would deter Iran from trying to strike. Associated Press writers Amir Vahdat in Tehran, Iran, and Jon Gambrell in Dubai, United Arab Emirates contributed to this report. What do Israel’s accusations mean for the Iran nuclear deal?